Though I never really discussed it much on here, a few months back I got a bar cart from Target that I had been lusting after forever. 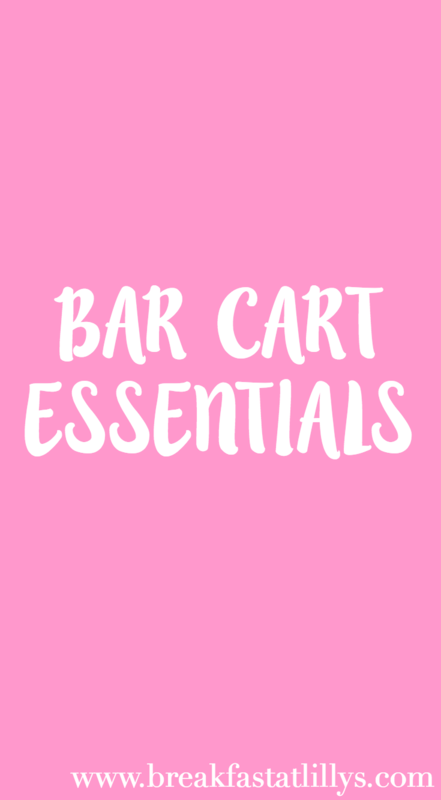 I have been slowly filling it up with bar accessories and today I thought it’d be fun start of Thirsty Thursday (as the college kids call it) with a post on my bar cart essentials. My bar cart’s color scheme is primarily gold and white. I feel like it looks classy and subtle but still cute. I haven’t finished accessorizing it quite yet but these are some of the items that I think are essential. Tall vase // I really loved the way that this tall glass looked. I store my paper straws in this vase to keep them contained and a little more orderly. Acropolis Platter // I have been completely obsessed with marble lately so I knew I had to get something marble for my bar cart. I decided on a tray because it is both a decorative and functional piece. Bar Print // Although I haven’t set up a gallery wall of prints above my bar cart like I was planning to, I do have a few in mind…like the one pictured above. I think the prints make the cart even more fun. Glasses // I have the two gold polka dot wine glasses pictured above along with two moscow mule glasses on top of my bar cart. They jazz up the cart even more. Bar Accessories // I also have cute bar accessories displayed on my bar cart. Whenever Lilly released the Lilly for Target line last April, I just knew that I had to get my hands on the bar accessories. I got the giraffe bottle opener and the miscellaneous animal adorned wine stoppers. Alcohol // Last but not least, I have some alcohol displayed on the bottom of my bar cart. I definitely need to add to that collection soon but for the time being I only have two bottles. Some bar cart, eh? Do you have a bar cart? If not, do you want to get one in the future? If so, what are your bar cart essentials?Let me know down in the comments.